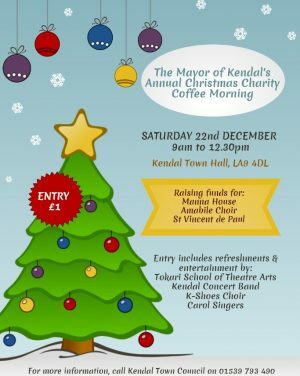 The Mayor of Kendal is holding his annual Christmas Charity Coffee Morning on Saturday 22nd of December at Kendal Town Hall from 9am to 12.30pm. Entry is £1 which includes a cup of coffee and a mince pie or biscuit; there is a raffle and cake stall plus entertainment from Tokari School of Theatre Arts, Kendal Concert Band and K-Shoes Coral Singers. The Christmas Coffee Morning is supporting The Mayor’s charities which this year are Manna House, Amabile Choir and St Vincent de Paul.